Acoustic Improvements at Rollins Chapel | Resource Systems Group, Inc.
Rollins Chapel, on the campus of Dartmouth College campus in Hanover, New Hampshire, has been the center of religious services since the late 1880s. One of its centerpieces is a beautiful Austin organ, which is used for both religious services and concerts. In 2006, the installation of a sprinkler system gave the college an opportunity to refurbish the organ and make changes to the interior to improve the acoustics for organ music. RSG conducted extensive acoustical measurements of the existing chapel and organ including sound absorption testing in the RSG acoustical laboratory on mockup of the existing chapel ceiling. We developed a CATT Acoustic computer model of the space and modeled various improvement alternatives, including reflectors, elimination and/or replacement of ceiling finishes, and installation of variable acoustic elements. A computer auralization was presented to the college and college organist, which allowed them to listen to a comparison of the existing space with the improvement alternatives before implementing the changes. 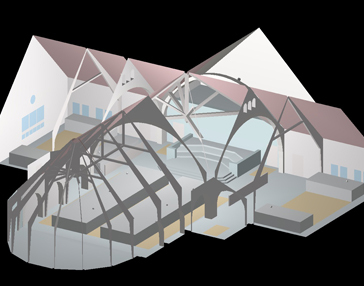 Guided by limitations on the ability of the roof to handle structural loads, the college chose one of the alternatives – to remove lightweight panels over the organ that we found were acting as high-frequency sound absorbers.